So in unpacking all my junk I seem to have collected over the years, I found a plate that I've had in storage for years. Originally my plan was to have a few favorite to hang in my kitchen. My first thoughts were that is just so old school and outdated and then I found this picture that gave me inspiration. Though I only have two in my collection this won't work but I still loved the design detail and variance of the traditional plate hanging. 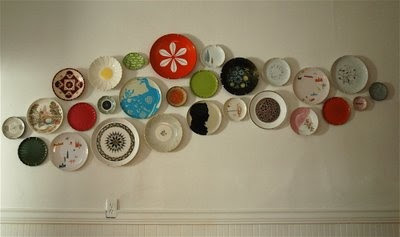 I'm usually not a fan of using any sort of dish as a decoration... but they make it look good! I wouldn't have thought it possible!